Besides the stove, refrigerator and sink, all kitchens have one other thing in common: there’s never enough counter space. Enough room to work is essential for a properly running kitchen. The temptation, however, is to fill that empty space over time. The result is a slowly shrinking countertop, as appliances, canisters, and other kitchen items began to fill it up. In some cases, the kitchen counter space could just be inadequate, no matter how much you clear it off. Below we’ve got some tips to help you make the most out of your existing countertops or some clever ways of adding more. The first step is to see which you have to work with. Take a look at the possible workspace on your existing counters and try to determine what really needs to be kept out on the countertop. Make the most of your under-cabinet space. Instead of having a microwave, radio or electric can opener sitting on the counter, for example, buy under-the-cabinet models instead. Not only will this put them at a more comfortable working height for you, but it will free up some of that valuable workspace below. Under-the-counter organizers are available, as well. These can be useful for storing seasonings and other small containers that would otherwise clutter up your workspace. By purchasing a cutting board designed to be used over the sink, you’ll be making good use of workspace while chopping vegetables and have the added convenience of being able to slide the waste off into the sink. Having an installed garbage disposal works well with this set up. 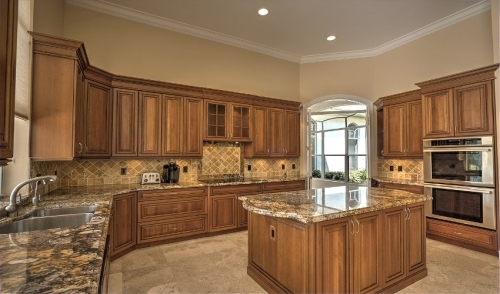 Make the most use of your kitchen cabinets by installing new and innovative storage systems. Door racks are available for the inside of your cabinet or pantry doors that can store a variety of things. Doing so could free up valuable cabinet space, in which you could store larger items that were on your countertop. There are slide out systems for cabinets as well, for ease of access. Once you’ve cleared off your countertops as much as possible, but still think you need more counter space, consider adding an island to your kitchen. Not only will you gain more workspace above, but you will have storage space below. There are many options available. You could permanently install the island to the floor and match it to your existing cabinetry and countertops, or you could have a freestanding table – even one with wheels that can be easily rolled out of the way when not in use. This is also an excellent way to repurpose an old desk or table. With a coat of paint, some wheels, and newly installed top on an old desk or table you could have an attractive, unique addition to your kitchen decor. The layout of some kitchens doesn’t allow for an island, however. In these cases, it may be possible to extend the countertop, even if temporarily. By making use of fold-down or pull-out surfaces, you’ll be able to instantly add horizontal space when you need it, and put it away when you don’t. This could be as simple as adapting to your existing counter with a butcher-block and hinges, or installing a pullout system when putting in new countertops or cabinetry. We have many innovative solutions and design ideas available. Simply stop in and tell us what you would like to accomplish, and we’ll help you to get that extra counter space that you need.